Students from the Wolff Center for Entrepreneurship traveled to Omaha, Neb. this January to have lunch and tour Berkshire Hathaway with famed investor Warren Buffett. Famed investor Warren Buffett recently met with a select group of undergraduate students from the C. T. Bauer College of Business at Berkshire Hathaway headquarters in Omaha, sharing his wisdom on life, business and success. 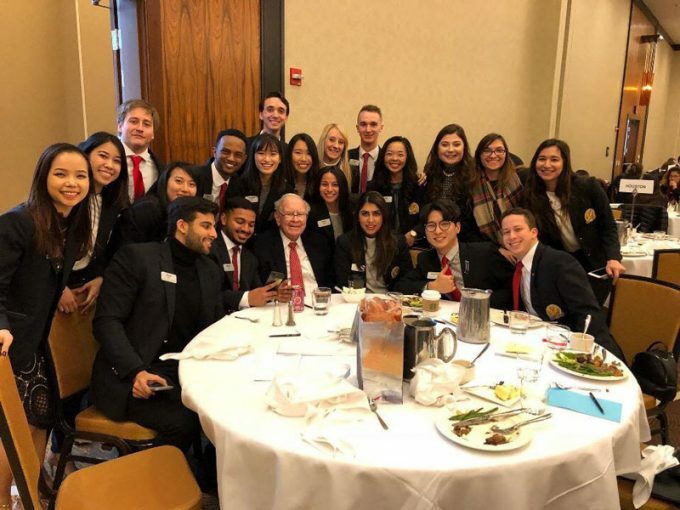 Twenty students from Bauer’s Wolff Center for Entrepreneurship were part of a select group invited in January to tour Berkshire Hathaway headquarters and have lunch with Buffett. During the lunch, Buffett spent time one-on-one with the students, giving them the chance to ask him anything during a question-and-answer session. Since 2009, Buffett has included Bauer in his exclusive list of schools invited to spend time with him. The center’s namesake, Melvyn Wolff (BBA ’53), who passed away last May, served as chairman of Star Furniture, a Berkshire Hathaway company.